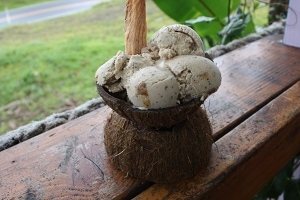 Before our trip to Hawaii, I heard about Coconut Glen's vegan coconut milk ice cream from a blogger. 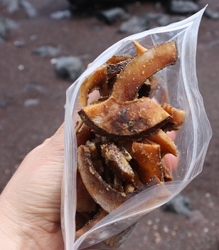 When I opened my guidebook to make a note of it in the Highway to Hana section, I saw they had already written about Glen's, which is pretty rare and exciting. 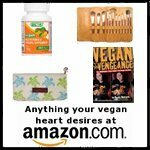 Any time I find a vegan restaurant is highlighted in a mainstream guidebook, I know it must be something special. The Road to Hana is a spectacular stretch of road that wraps its way through the rainforest of Upcountry/East Maui, offering you incredible views of both the ocean and the jungle. You stop often to take pictures, hike to waterfalls, or just to gaze at the overwhelming sea vistas. I enjoyed every minute, but I can't hide the fact that in the back of my mind I was slightly worried about one thing; what if by the time we made it to Coconut Glen's, they were closed? You see, Coconut Glen's is just past the 27th mile marker, so it's pretty far down the road. Their website doesn't advertise their hours, reviews said sometimes it's just closed, we're on Maui time, and it happened to be a Sunday, so I had reason to worry. We turned the corner and saw the open sign and pulled up singing a made-up coconut jingle. You might think all this excitement is coming from a returning customer, but it was my first time. It's just that I would have been so disappointed not to be able to try their coconut milk ice cream and report back to you about it. 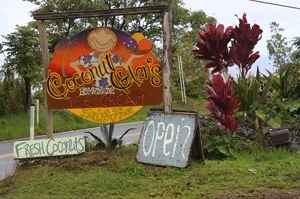 Many people who stop there actually get to meet Coconut Glen himself, but he was out of town on the mainland. In his place was a friendly lady who let us try a few samples before settling on the winners. 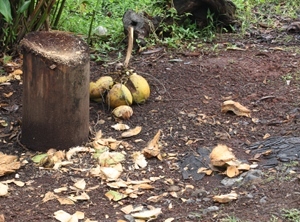 The fun, tropical part of the experience is that you get to eat out of coconut shells with coconut shell slivers as spoons. I was worried I was going to get a splinter in my lip, but was assured it's never happened. Your coconut shell bowl rests on another shell in perfect Maui style. 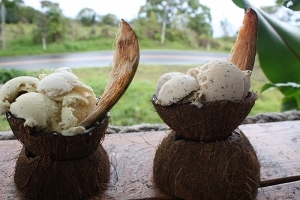 I chose a scoop of pineapple-banana as well as a scoop of lilikoi, Hawaiian for passionfruit. 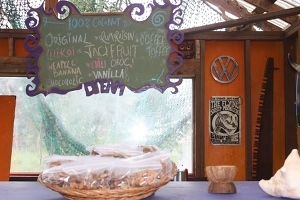 Lilikoi was slightly tart, and the pineapple banana was perfectly sweet and tropical. My husband got coffee toffee because he's a coffee ice cream aficionado. The toffee was an awesome stripe of crunchy candy throughout, and you could also see specks of coffee beans in his ice cream. On a side note, a few locals showed up to order some ice cream to go and I heard them say that coffee flavor is weird with coconut milk. They were obviously not vegans and perhaps look down on the idea of coconut milk substituting perfectly for cow's milk in ice creams. I would like to tell those people that the coconut flavor was not prominent in Coconut Glen's coffee toffee ice cream, and it wasn't at all "weird." So there. 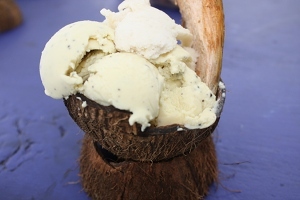 Maybe the coolest part is that Coconut Glen's has the atmosphere of a tiny bar, and as you're enjoying your huge scoops of coconut milk ice cream, you can sit facing the ocean side of the road and murmur the words to your own coconut jingle. 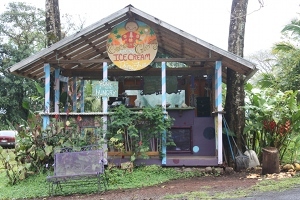 It's well worth the stop, and the highish price for the fresh coconut milk ice cream.